This is a medium size room very quiet and fully equipped with a study area. You can find a window facing an interior and quiet patio. The room is next to the hall of entrance of the apartment and far from the living and kitchen areas. This Inèdit room is a big interior room with a cozy double bed and a big window facing to an interior patio. Its high ceilings make the room really spacious. There is also a 3 door closet to allow you organize all your belongings and a comfortable and big working area. This is a quiet room as it is located far from the living room and the kitchen. It is in a big hall where Room 1 also is. This room is perfect for students and young professionals who need a big place to relax with a comfortable working area while sharing their co-living experience with people from all over the world. 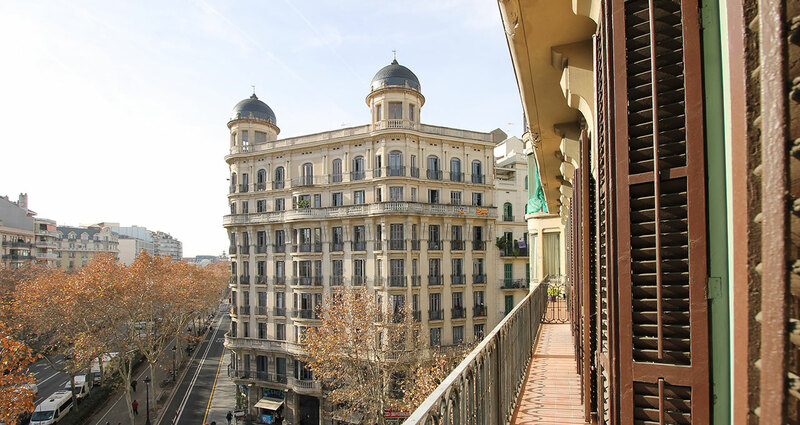 This incredible and amazing Inèdit apartment is located in Gran Via de les Corts Catalanes, one of the most important and central streets in Barcelona. The location is perfect, it is really central, just 8 minute walking distance to Plaça Espanya and Parallel and just 15 minute walking distance to Plaça Universitat and 20 minute walking distance to Plaça Catalunya on the other side. Furthermore, in 200 metres from the main door of the building, there is the Rocafort metro station (L1). This more than 200m2 apartment is in an elegant and majestic modernist building with an elevator and with an incredible main hall and doorwoman. It has 9 cozy rooms and one of them is shared, so there will be a maximum of 10 students home at a time. 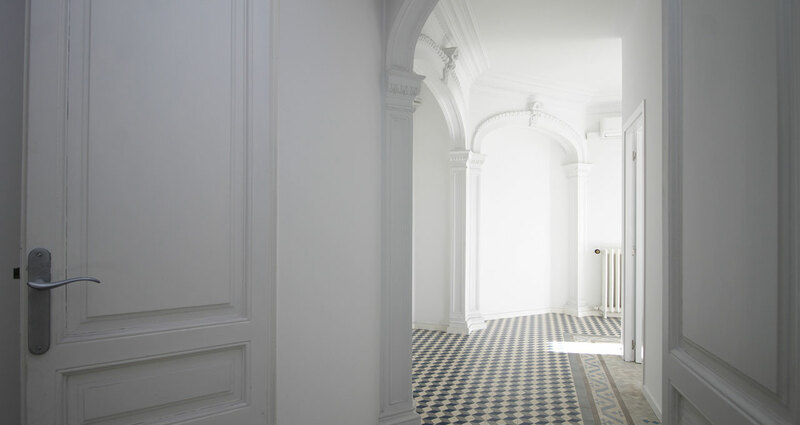 It has a welcoming hall that is really spacious thanks to the high ceilings of the apartment. There is also a bright and huge living room with a TV, a perfect place to relax and a wonderful dining room with a wall full of windows and a big table with chairs to share your time and co-living experience with your flatmates. Next to the dining room area, there is a laundry room and a huge clothes line. There is also a beautiful kitchen in the apartment, just renewed and well decorated and completely equipped. The apartment has two bathroom with a shower. There is also AC and heater system by air in the complete apartment and in all rooms except for Room 2 and Room 8. 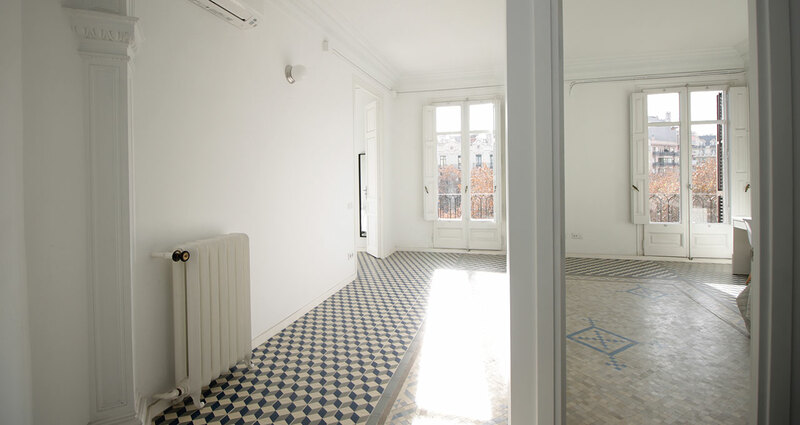 You will find this apartment in the Eixample Esquerre neighborhood, located on the left side of Passeig de Gràcia, really centric. In this neighborhood you will find all different services around: bars, shops, restaurants, theaters, gyms, and more. Also, some of the best architectural modern buildings are located around this area. Also, there are some campuses from different universities around, so there is always a lot of young people in the streets. This apartment is the perfect option for students and young professionals who want to live in the city center of Barcelona and next to all services. Sharing your co-living experience with people from all around the world, and will make an unforgettable and useful life experience. In this apartment, you will always have a mate to do something together and for sure, you will always have the opportunity to relax in your incredible and private room.